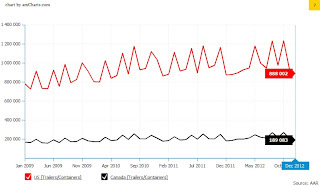 Despite US rail carloads declining 3.1% in 2012, intermodal usage continued to increase. For 2012, rail intermodal increased 3.2% helped by increasing automobile manufacturing. This increase was just 0.1% off of the 2006 record. More than likely a new record would have been set in 2012 if not for the labor strike at the ports of Los Angeles and Long Beach in late November and also Super storm Sandy which caused serious disruption of rail and port operations on the US east coast. One record the Association of American Railroads noted that was set was that of the use of containers. In 2012, container volume on US railroads represented 87% of total intermodal volume, up from 69% in 2000. 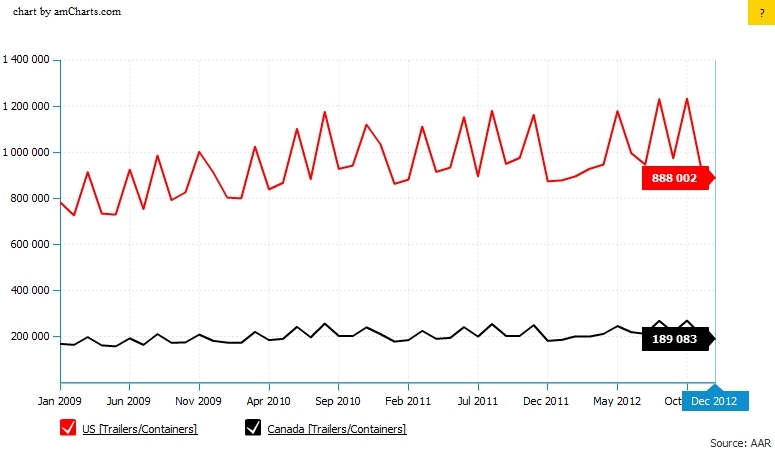 The ease of unloading and double stacking of containers attributed to the increase. US Class I railroads all recorded increases in intermodal for the year. For the East Coast railroads, CSX reported a 7.4% increase while Norfolk Southern reported a 4.4% increase. For the West Coast, Union Pacific reported a 2.0% increase and BNSF reported a 2.6% increase. The smaller Kansas City Southern Railroad reported a 6.0% decline; however its Kansas City Southern Mexican subsidiary reported an 8.7% increase. This increase was due to the large volume of automobiles that were moved into the US from Mexico. The railroads are optimistic for 2013 as all intend to focus on increasing carloads by targeting the energy industry but intermodal is also a major focus. For Norfolk Southern, the railroad plans to increase capacity to handle additional highway conversions and East Coast imports by establishing new Crescent Corridor terminals in Memphis, Tennessee, Birmingham, Alabama, and Greencastle, Pennsylvania. Beginning in January, the company also plans to introduce new long-haul service lanes through Birmingham to the West, Mexico and the Northeast via terminals in Greencastle and Harrisburg, Pennsylvania. In 2012, CSX invested in its National Gateway double-stack intermodal corridor from Mid-Atlantic ports to the Midwest. New or expanded intermodal terminals are under way in Columbus, Ohio; Charlotte, North Carolina; Cincinnati, Ohio; and Worcester, Massachusetts. According to the company, "This expanded intermodal capacity will be an important part of competing for an estimated 9 million truckloads that currently have a length of haul of more than 550 miles in CSX-served markets." For Kansas City Southern, the railroad plans to continue to take advantage of the nearshoring phenomena Mexico is experiencing. According to the company, as of mid-November, KCS' auto volume was up 21% year-over-year, with much of that growth from Mexican auto production. "We expect that growth to continue in the first part of 2013 and to accelerate into the first quarter of 2014, when new Honda and Mazda plants, and an expanded Nissan plant come online," according to the CEO of Kansas City Southern, David Starling. The railroad is also experiencing significant container growth at the Port of Lázaro Cárdenas in Mexico as it is the only railroad with connections to this port.